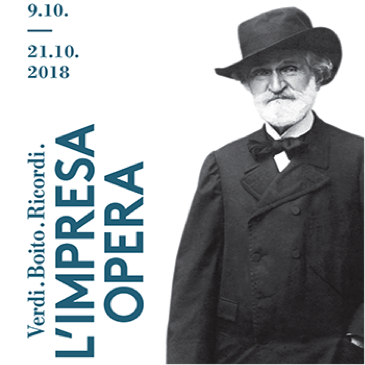 On the occasion of the first edition of the Vicenza Opera Festival, Ricordi & C. and Bertelsmann present the exhibition L’Impresa Opera – Verdi. Boito. Ricordi. from 9th to 22nd October 2018 at the Teatro Olimpico in Vicenza. The exposition, curated by Gabriele Dotto and divided in thematic sections, highlights a selection of original documents preserved in the Archivio Storico Ricordi to narrate the creative process at the base of the birth and the success of the last two operas by Giuseppe Verdi, Otello and Falstaff. These operas are the result of the collaboration of three genial brains: of the famous Maestro, of the brilliant librettist Arrigo Boito and of the expert publisher Giulio Ricordi. It was such an extraordinary joining of creative energies so different but so well combined, that the three men incessantly proposed and declined, valued and procrastinated, discussed and modified and at the end created (and brilliantly launch) two of the greatest and longest masterpieces of the Italian opera. The exhibition is open for the audience of the Vicenza Opera Festival (before and during the intermissions of the two Falstaff performances and the concert Lirico-sinfonico) and for the visitors of the Teatro Olimpico in the opening times.